Prime Minister Hun Sen yesterday ordered the construction of a $1 million barrier to prevent seawater from flowing into freshwater canals in Kampot city. During an inauguration ceremony for the Kampot Water Supply System expansion project, Mr Hun Sen told Cham Prasidh, Minister of Industry and Handicrafts, to execute the plan with the Environment Ministry. “If both ministries do not agree with each other, then I will order the Ministry of Water Resource and Meteorology to build it […] because I heard that it’s worth $1 million,” Mr Hun Sen added, noting that the money will come from the government’s national investment fund and that the barrier is to be built in the Kamchay Hydropwer Dam area. He said that Mr Prasidh should call on the Mines and Energy Ministry to meet about the building of the barrier. 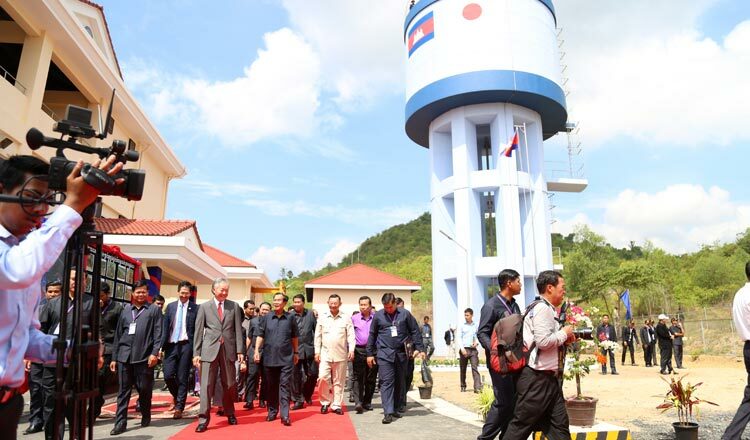 Additionally, Mr Hun Sen noted that the ministries will need to find private sector partners to produce clean water because the Kampot Water Supply System cannot produce enough water for the whole province. Provincial Governor Cheav Tay could not be reached for comment yesterday. Industry and Handicraft Ministry spokesman Heng Sokong declined to comment, while Um Sotha, another spokesman, could not be reached for comment. Chan Youttha, spokesman at the Ministry of Water Resources and Meteorology, could not be reached for comment yesterday.